There are loads of reasons for purchasing digital projectors, and one of the main would be the fact that you get an amazing viewing experience, like having a movie theater in your own home. Since there are numerous different types of projectors available, searching for the right one to effectively work best for you isn’t always easy and quick. One of the most important aspects to take into consideration when purchasing projector would be the projector’s brightness which is rated in lumens. A lumen rating implies the overall brightness that certain projector is able to produce. This is neither a 1080p projector nor a 4K, but it is going to do its job for the price, and very well indeed. It is very affordable, but high quality LED projector. Besides the projector itself, you will also find the remote control (nice as well as pretty basic and simple), a power cord, rubber cover for the lens (to protect it from scratches), and AV adapter (for hooking up various components) inside the box. Who Should Buy This Product and Why? Taotaole Multi-media Mini 800 Lumens Projector is well worth the money and an amazing deal. It is extremely easy to use, and also relatively small – therefore it’s really easy to transport. 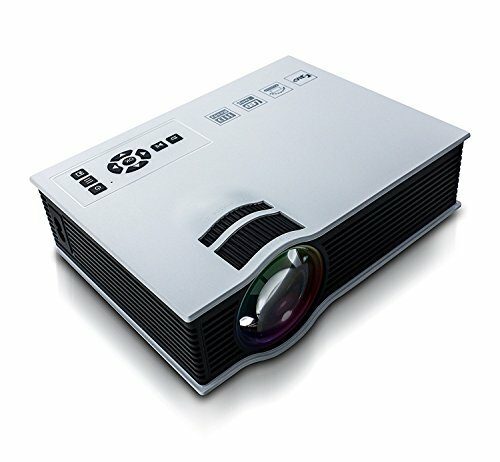 There are a lot of input options on this projector meaning you are able to connect it to just about any device. This is an amazing little projector for watching movies or playing games in an extremely fun and enjoyable way. Anyone who is looking for a great projector at a really great price should take this awesome projector into consideration. This little projector will accept connection via USB, HDMI, or SD card. The multimedia slots on this projector allow you to use an SD card or USB flash drive instead of the HDMI cable eliminating a bunch of wires, and making it even more portable and easier to use. There are two USB ports on the Taotaole Multi-media Mini 800 Lumens Projector – one is for charging purposes (in case you want to charge your smartphone, tablet, or some other device), and the other USB port is for data purposes (in case you need to connect, for example, your memory stick in order to play and watch movies with the projector). There are plenty of on-screen adjustments that you are able to make in order to fine-tune this projector to provide you with the best viewing experience possible. It is quite important to note that with this type of projector, it is advisable to have the area/room you are viewing the projector as dark as possible since sunlight and overhead lights will drown the light produced by this LED, and will make the image quality suffer. However, in dark viewing, the image quality is fantastic. This means that while watching the HD movie, you won’t notice any pixels, and everything from faces and text, to objects in motion will be very clear. Regarding the sound quality, the built-in speakers are pretty loud, but for bigger rooms or outdoors viewing, it is advisable to connect it to your speakers or stereo system for a surround sound experience.